If you're not sure what thread size you need, or need to send us a sample, please go to our 'Thread Data' page by clicking here. All dimensions are in millimetres and all sizes have hexagon socket ends for driving with allen keys. Socket sizes are stated in millimetres. If you need a key, please click on the symbol in the tables below and you will be taken to the allen key and ball driver page, or click here. These grub screw kits are a handy selection of popular cup point sizes used in many hobby , household and engineering applications. Each kit contains sizes ranging from M2 to M6 plus the correct sized hex keys to drive them. We offer an option of a stainless steel kit and a black HT steel kit. Please scroll to the bottom of this page for more details or click here. To order, click on the 'Add to Order' button alongside the items of your choice. You can select the quantity on the order form (default is 1). To continue ordering other items, use the 'Continue Shopping' button on order form. All our metric grub screws are standard pitch (metric coarse) as below unless stated otherwise. 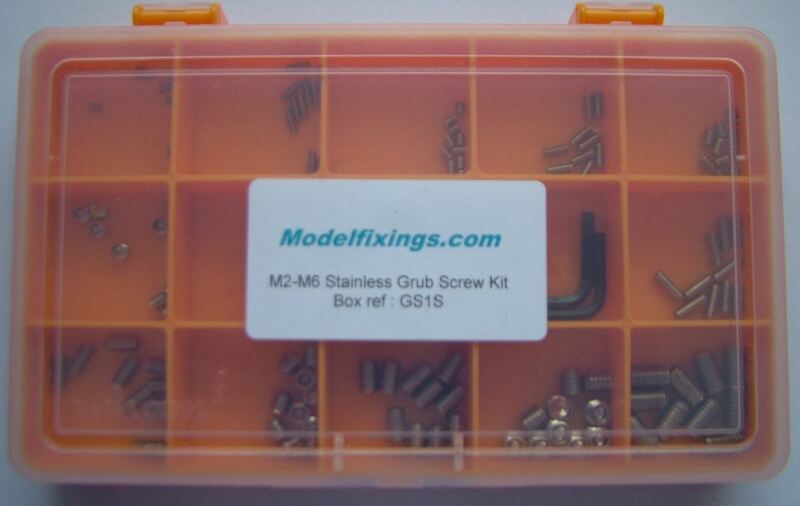 These grub screw kits are a handy selection of popular cup point sizes used in many hobby, household and engineering applications. Each kit contains sizes ranging from M2 to M6 plus the correct sized hex keys to drive them. We offer an option of a stainless steel kit and a black HT steel kit. Supplied in a high quality, UK manufactured plastic box with a snap close transparent lid which closes precisely so the contents won't get mixed up even if the box is inverted. Box measure 17 x 10 x 2cm.